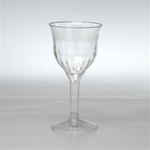 Plastic Stemware are fancy and economical champagne and wine glasses for catering weddings and parties. 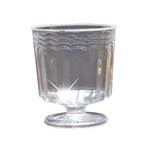 Plastic Stemware come in many different sizes and shapes for your parties. Some are 1 piece while some are 2 piece. Use versatile stemware from everything to beverages and frozen cocktails to desserts, appetizers and even soup. Anything that is served in a bowl looks even better in a glass! 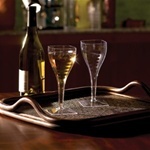 Stemware is the perfect alternative solution for presenting your culinary delight in creative ways. 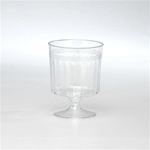 Our catering Stemware can be used for catering weddings, banquets, parties or for your everyday restaurant supplies. 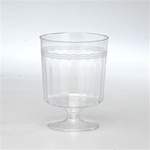 Don't forget our plastic parfait cups for serving desserts at your event or for ice cream shops. 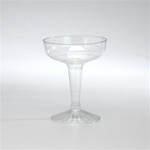 EMI Yoshi Plastic Champagne Fluted Glasses 1 Piece Clear - 5 Oz. EMI Yoshi Plastic Poly Bagged Clear Square Champagne Glass 1 Piece - 8 Oz. EMI Yoshi Plastic Resposable Footed Wine Glasses Clear - 2 Oz. 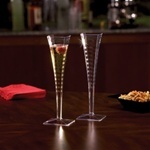 EMI Yoshi Old Fashioned Plastic Champagne Glasses 2 Pieces Retail Pack - 4 Oz. EMI Yoshi Old Fashioned Plastic Champagne Glasses 2 Pieces Institutional Pack - 4 Oz. EMI Yoshi Plastic Fluted Wine Goblets 2 Pieces - 6 Oz. 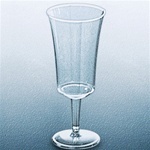 EMI Yoshi Plastic Fluted Wine Goblets 1 Piece - 8 Oz. EMI Yoshi Plastic Poly Bagged Square Champagne Glass 1 Piece Clear - 5 Oz. 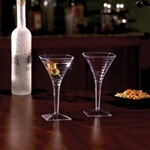 Disposable Plastic Stemware at wholesale prices from the leader in restaurant supply. Our wine glasses, champagne glasses, dessert cups, coffee cups and more will make for an easy cleanup at your next catering event, yet they look classy. If your catering company is looking for some disposable Plastic Stemware at wholesale prices that won't break the bank, then look no further for your fluted wine glasses.